In all my years on this good green earth I have never grilled a flank steak. It’s just a cut of meat that I never bought. Never thought to buy until now. I got the marinade for this recipe from a site called Use Real Butter. The owner of this fabulous blog is Jen. Aside from the beautiful pictures of food that she takes, the rest of her photography that is non-food related, is stunning. If you visit her site make sure to link over to her Photo Blog. I guarantee you that you will be inspired. I know I was. 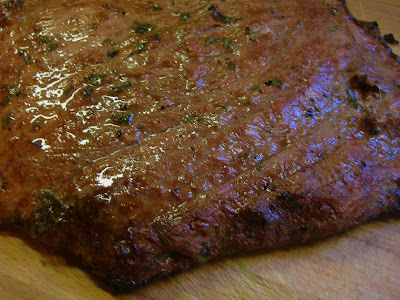 While oogling over all her gorgeous photos I came upon the lovely flank steak marinade and knew I had to try it. 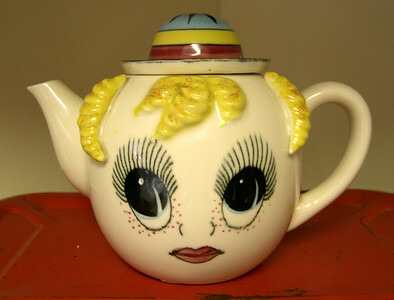 It smelled so good in the bowl that I actually carried it around the house and made everyone smell it. I really did. They all said it smelled great, and it did. It tasted pretty awesome too. Like Jen, I placed the marinade and steak in a zip lock bag and into the fridge it went. Marinate for 24 hours for best results. We grilled this steak for about 3 -4 minutes on each side. To use as a sauce – pour remaining marinade into a pot and bring to a boil. You can add some cornstarch mixed with water to thicken it up a bit. omg! i need red meat now that top picture is fabulous! How absolutely yummy! Wowzer, I heart meat! I love grilled flank steak! This looks fantastic! 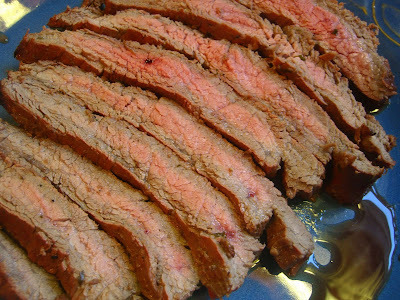 Flank steak is one of our family's favorite cuts. If you like it, try skirt steak too.